→Thyrotoxicosis vs Hyperthyroidism: What’s the Difference? It may surprise you to know that around 1% of the population suffers from this condition (1). And it's especially important if you consider that a small percentage of patients with this disease may go on to develop thyroid storm. But what exactly is thyrotoxicosis? Is it a problem if you have it? Is it different from hyperthyroidism? 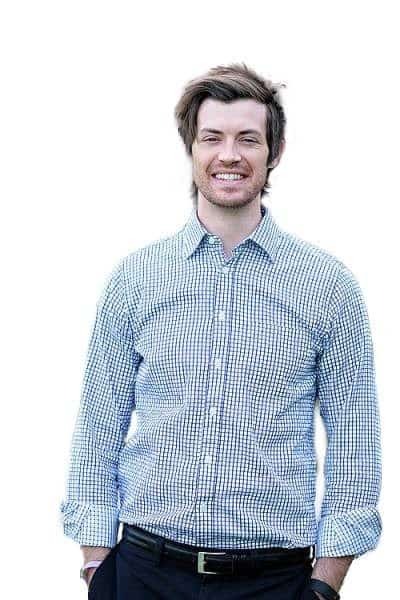 In this article I'm going to walk you through this condition, we are going to discuss what it is, how it affects your body, the consequences of this condition, how to treat it, and more. When it comes to your thyroid there are many different problems that can arise. The most common thyroid condition is known as hypothyroidism which is a condition of too little thyroid hormone. Another common condition (although not quite as common as hypothyroidism) is hyperthyroidism which is a condition of too much thyroid hormone. Thyroid hormone plays a very important role in regulating many processes in your body. But, like other hormones, the goal is to have the right balance of thyroid hormone at any given time. If this balance shifts to too much or to too little then symptoms may arise and problems may start to occur. Thyrotoxicosis is the name we give to a series of symptoms which arise from excessive thyroid hormone stimulation (2) on your cells and in your body. Normal amounts of thyroid hormone help to create energy, manage your metabolism, regulate other hormones, promote hair growth, promote regular bowel movements, and help your heart beat regularly. If your cells start to become overstimulated by thyroid hormone (from various conditions which we will explore below) then you are said to be in a state of thyrotoxicosis. And this condition, if not treated, can directly lead to damage or death of your cells (which is why it must be taken seriously). And this state is very harmful to the body! In fact, untreated thyrotoxicosis can lead to serious consequences such as bone loss and heart problems if not treated relatively quickly. In addition, it can also lead to a more serious and potentially life-threatening condition known as thyroid storm (3). The terms thyrotoxicosis and hyperthyroidism are often used interchangeably, but it's important to realize that they are not the same condition. Distinguishing between these two conditions is actually very important because it may impact your treatment and your prognosis going forward. Hyperthyroidism is the name of several different diseases and conditions which ultimately lead to excessive amounts of circulating thyroid hormone in the body. Thyrotoxicosis, on the other hand, is the name given to the symptoms that arise from the excess thyroid hormone. This state often is associated with very characteristic symptoms which we will go over below. But, just because you have hyperthyroidism doesn't mean that you are in a state of thyrotoxicosis (4). In fact, the entire goal of treating hyperthyroidism is to help reduce thyroid hormone, reduce the impact of thyroid hormone on your cells, and normalize thyroid levels. Taking hyperthyroid medications such as methimazole help to reduce thyroid hormone production and conversion thus reducing the impact of thyroid hormone on your cells. Undergoing a thyroidectomy or RAI reduces the total amount of thyroid hormone produced by destroying or removing the gland that produces thyroid hormone. All of the treatments for hyperthyroidism focus on this goal! If you have hyperthyroidism and you are still in a state of thyrotoxicosis then that is an indication that your treatment is insufficient or needs to be adjusted. Because, in a perfect world, all therapies designed to treat hyperthyroidism should help normalize thyroid levels. This means that the symptoms of thyrotoxicosis can be used as a marker to determine if you are getting adequate treatment for your hyperthyroidism. Now that you understand what thyrotoxicosis is, it's relatively easy to talk about the conditions which may cause this problem. It can be the result of any condition which results in hyperthyroidism and which isn't treated accurately. Remember, the entire goal of treating hyperthyroidism is to reduce the impact of thyroid hormone on your body. Graves' disease (5): The most common cause of thyrotoxicosis is from Graves' disease. This autoimmune condition of the thyroid gland results in excess production of thyroid hormone due to antibody stimulation. Toxic multinodular goiter (6): Rarely, some goiters can autonomously produce thyroid hormone. If this happens they are referred to as toxic nodules. This condition is uncommon as most thyroid nodules do not produce thyroid hormone and are completely benign. Thyroiditis: Thyroiditis literally means inflammation of the thyroid gland and this condition can result in excessive production of thyroid hormone. Any condition which causes inflammation also causes damage and this damage may cause the 'leakage' of thyroid hormone into the bloodstream. Conditions such as Hashimoto's thyroiditis, subacute thyroiditis, postpartum thyroiditis and so on can all cause thyrotoxicosis. The good news is that many of these conditions resolve on their own without treatment (with the exception of Hashimoto's thyroiditis). Thyroid medication (7): Your body can produce too much thyroid hormone on its own but you can also take too much thyroid medication by mouth. This condition tends to arise from people who take too much thyroid medication or the wrong type of thyroid medication. The good news is that simply dropping your dose of thyroid medication is usually enough to resolve the issue. You can prevent thyrotoxicosis from occurring in this setting by regularly checking your thyroid lab tests. Prescription medications (8): Certain prescription medications (such as Amiodarone and amphetamines) can stimulate thyroid hormone production or damage the thyroid gland. Damage to the gland, much like damage from inflammation, may cause the excessive release of thyroid hormone into your bloodstream. This is rare, but should be considered with certain medications! Believe it or not, it's actually hard to miss the diagnosis of thyrotoxicosis because the symptoms are almost impossible to miss! Good in the sense that you should be able to identify the problem and know if your treatment is working. And bad in the sense that you may feel poorly while you are undergoing treatment and diagnosis. All of these symptoms occur from overstimulation of your cells by thyroid hormone. They should completely resolve as you undergo treatment! If your symptoms persist despite starting treatment then this may be an early indication that your treatment is not enough. You can easily diagnose thyrotoxicosis with evaluation of clinical signs and symptoms and with the use of specific laboratory tests. If you have this condition then you will definitely experience some or all of the side effects that I've mentioned above. In addition, the effect of excess thyroid hormone in the body causes specific changes that can be picked up through routine laboratory testing. As thyroid hormone levels increase your TSH will start to decline. In addition, your free thyroid hormone levels will start to rise. This pattern is observed in almost all cases of hyperthyroidism and thyrotoxicosis and can be a very helpful tool for identifying the condition. TSH (thyroid stimulating hormone): Your TSH will most likely be very low or close to zero. Free T3 (triiodothyronine, free): Free T3 will likely be elevated or high-normal. Free T4 (thyroxine, free): Your free T4 may be normal or low. TSI (thyroid stimulating immunoglobulin): If you have Graves' disease then your TSI may be elevated. You should always check for this antibody if you suspect you have hyperthyroidism because it is the most common cause of that condition. There is one other condition worth mentioning here which can confound your interpretation of thyroid lab tests and that is the condition of subclinical hyperthyroidism. 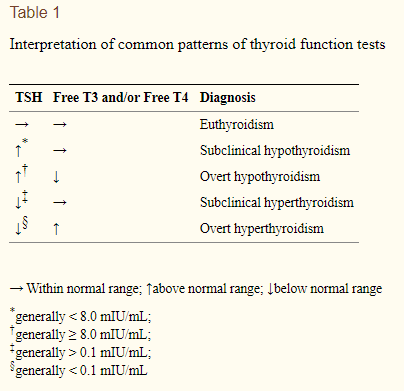 This condition results in a slightly lower than normal TSH but your free thyroid hormones (free T3 and free T4) are normally within the normal reference range. If you have this condition you may also experience minor symptoms of thyrotoxicosis but these symptoms are often not extreme enough to bring you to the Doctor. Symptoms such as minor fatigue, minor hair loss, minor changes in bowel movements, and so on can be confused with other conditions. There is a lot of conflicting information regarding whether or not this condition should be treated, but I wanted you to be aware of it in case your lab tests don't fit this 'typical' pattern. The entire goal when treating this condition is to focus on reducing the impact thyroid hormone has on your cells while also attempting to reduce the total amount of circulating thyroid hormone. Thyroid blocking medications (9): Usually the first line of treatment for excess thyroid hormone is to attempt to prevent your thyroid from creating more thyroid hormone and to block its metabolism or conversion in the cells. This can be done with the use of anti-thyroid medications such as Methimazole, PTU, and beta blockers. These should always be the first step in treatment because they are not permanent solutions and you can always be more aggressive over time if necessary. Thyroid surgery: If anti-thyroid medication fails then you may need to have your thyroid gland completely removed. This procedure is known as a thyroidectomy and it can be used to treat hyperthyroidism. One downside to this procedure is that you will be required to take thyroid medication by mouth for the rest of your life afterward, but this may be preferable than suffering from the side effects of thyrotoxicosis. Radioactive iodine ablation: Another option if thyroid medication fails is to undergo radioactive iodine ablation. This procedure results in the destruction of your thyroid gland through the use of radioactive iodine. After this procedure, you will also be required to take thyroid medication by mouth because your thyroid gland will no longer be functioning. No treatment at all: In some cases, especially in certain cases of thyroiditis (10), you may not need treatment at all for your symptoms. These conditions may result in a reversible cause of thyrotoxicosis that will completely go away over time. This is the best case scenario and it doesn't happen often, but you should be aware of it. What happens if you don't get treatment or what happens if you don't get enough treatment? It's helpful to think of thyrotoxicosis as a toxic condition for your cells which may lead to serious long-lasting conditions if not treated appropriately. It is dangerous for this condition to be left unchecked because it can result in permanent damage to certain tissues in the body. The most concerning include your bones and your heart tissue. Bone Loss and Osteoporosis - Untreated thyrotoxicosis can lead to osteoporosis. This condition is serious because it can potentially lead to early fractures, hospitalizations, chronic pain, and increase your risk of infections. Excess thyroid hormone increases bone cell turnover (11) which reduces the stability and strength of your bones. This risk seems to only be prevalent in women who have gone through menopause. Some studies show that women who are menstruating may be protected from this consequence (12). Cardiac Enlargement - Another serious problem is that excessive thyroid hormone can stimulate your cardiac (heart) tissue and result in an enlarged heart as well as changes to blood pressure (13). As your heart enlarges it may increase your risk of heart disease, the development of arrhythmia, heart failure, and lead to premature death. Don't let these side effects scare you! They can both be prevented with early diagnosis and treatment. 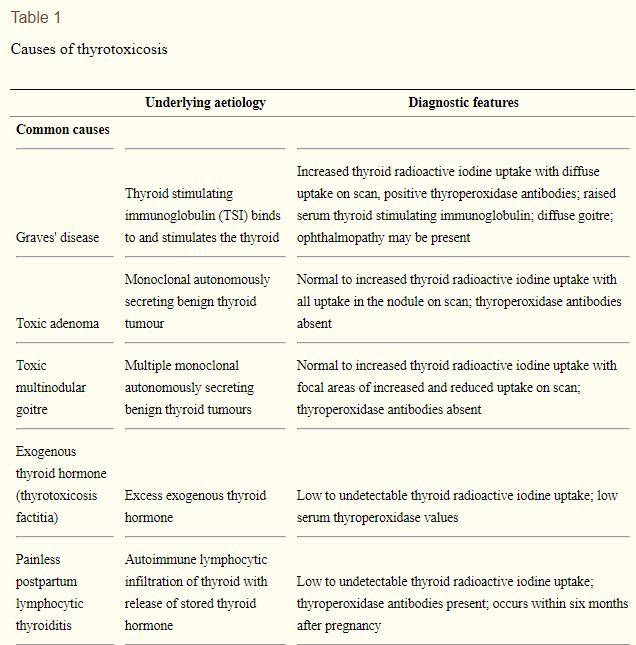 Lastly, it's important to differentiate between the condition of thyroid storm and thyrotoxicosis. 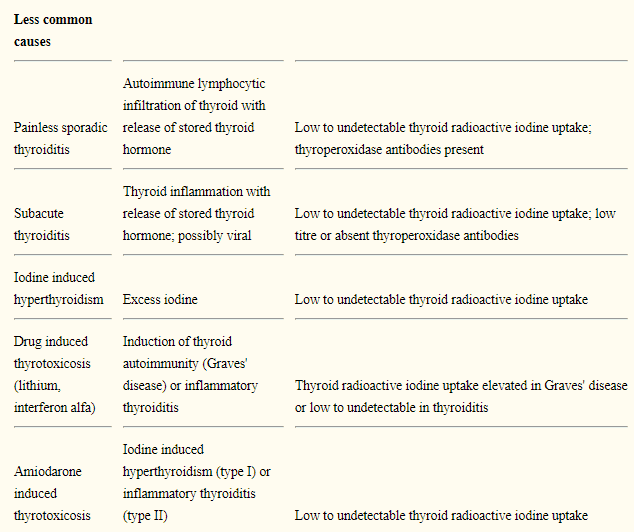 These conditions are related in that thyrotoxicosis can lead to thyroid storm, but they are different entities entirely. Thyroid storm is a life-threatening medical emergency which can result from excessive stimulation of your cells by thyroid hormone. It occurs in about 1-2% of people who have thyrotoxicosis and has a fairly high mortality rate (14). Thyroid storm can almost always be prevented as long as thyrotoxicosis is treated adequately with the therapies listed above. Rarely, it can occur spontaneously by various factors that may be out of your control. You can learn more about this condition here. Thyrotoxicosis is a serious condition that results from the impact of thyroid hormone on the cells in your body. This condition often arises from the same conditions that cause hyperthyroidism. When treating thyrotoxicosis the goal should be to reduce the damage that thyroid hormone is causing your cells by reducing total thyroid hormone and cellular thyroid conversion. By using this strategy you will be able to avoid long-term serious side effects and consequences of this disease. Are you suffering from thyrotoxicosis? What is causing your condition? What treatment are you using? Is it working for you? Why or why not?